Recurrent neural networks can also be used as generative models. This means that in addition to being used for predictive models (making predictions) they can learn the sequences of a problem and then generate entirely new plausible sequences for the problem domain. Generative models like this are useful not only to study how well a model has learned a problem, but to learn more about the problem domain itself. In this post you will discover how to create a generative model for text, character-by-character using LSTM recurrent neural networks in Python with Keras. Where to download a free corpus of text that you can use to train text generative models. How to frame the problem of text sequences to a recurrent neural network generative model. How to develop an LSTM to generate plausible text sequences for a given problem. Note: LSTM recurrent neural networks can be slow to train and it is highly recommend that you train them on GPU hardware. You can access GPU hardware in the cloud very cheaply using Amazon Web Services, see the tutorial here. Update Oct/2016: Fixed a few minor comment typos in the code. Photo by Russ Sanderlin, some rights reserved. Many of the classical texts are no longer protected under copyright. This means that you can download all of the text for these books for free and use them in experiments, like creating generative models. Perhaps the best place to get access to free books that are no longer protected by copyright is Project Gutenberg. In this tutorial we are going to use a favorite book from childhood as the dataset: Alice’s Adventures in Wonderland by Lewis Carroll. We are going to learn the dependencies between characters and the conditional probabilities of characters in sequences so that we can in turn generate wholly new and original sequences of characters. This is a lot of fun and I recommend repeating these experiments with other books from Project Gutenberg, here is a list of the most popular books on the site. These experiments are not limited to text, you can also experiment with other ASCII data, such as computer source code, marked up documents in LaTeX, HTML or Markdown and more. You can download the complete text in ASCII format (Plain Text UTF-8) for this book for free and place it in your working directory with the filename wonderland.txt. Now we need to prepare the dataset ready for modeling. Project Gutenberg adds a standard header and footer to each book and this is not part of the original text. Open the file in a text editor and delete the header and footer. You should be left with a text file that has about 3,330 lines of text. In this section we will develop a simple LSTM network to learn sequences of characters from Alice in Wonderland. In the next section we will use this model to generate new sequences of characters. Let’s start off by importing the classes and functions we intend to use to train our model. Next, we need to load the ASCII text for the book into memory and convert all of the characters to lowercase to reduce the vocabulary that the network must learn. Now that the book is loaded, we must prepare the data for modeling by the neural network. We cannot model the characters directly, instead we must convert the characters to integers. We can do this easily by first creating a set of all of the distinct characters in the book, then creating a map of each character to a unique integer. You can see that there may be some characters that we could remove to further clean up the dataset that will reduce the vocabulary and may improve the modeling process. Now that the book has been loaded and the mapping prepared, we can summarize the dataset. Running the code to this point produces the following output. We can see that the book has just under 150,000 characters and that when converted to lowercase that there are only 47 distinct characters in the vocabulary for the network to learn. Much more than the 26 in the alphabet. We now need to define the training data for the network. There is a lot of flexibility in how you choose to break up the text and expose it to the network during training. In this tutorial we will split the book text up into subsequences with a fixed length of 100 characters, an arbitrary length. We could just as easily split the data up by sentences and pad the shorter sequences and truncate the longer ones. Each training pattern of the network is comprised of 100 time steps of one character (X) followed by one character output (y). When creating these sequences, we slide this window along the whole book one character at a time, allowing each character a chance to be learned from the 100 characters that preceded it (except the first 100 characters of course). As we split up the book into these sequences, we convert the characters to integers using our lookup table we prepared earlier. Running the code to this point shows us that when we split up the dataset into training data for the network to learn that we have just under 150,000 training pattens. This makes sense as excluding the first 100 characters, we have one training pattern to predict each of the remaining characters. Now that we have prepared our training data we need to transform it so that it is suitable for use with Keras. First we must transform the list of input sequences into the form [samples, time steps, features] expected by an LSTM network. Next we need to rescale the integers to the range 0-to-1 to make the patterns easier to learn by the LSTM network that uses the sigmoid activation function by default. Finally, we need to convert the output patterns (single characters converted to integers) into a one hot encoding. This is so that we can configure the network to predict the probability of each of the 47 different characters in the vocabulary (an easier representation) rather than trying to force it to predict precisely the next character. Each y value is converted into a sparse vector with a length of 47, full of zeros except with a 1 in the column for the letter (integer) that the pattern represents. 0. 0. 0. 0. 0. 0. 0. 0. 0. 0. 0. 0. 0. 1. 0. 0. 0. 0. We can implement these steps as below. We can now define our LSTM model. Here we define a single hidden LSTM layer with 256 memory units. The network uses dropout with a probability of 20. The output layer is a Dense layer using the softmax activation function to output a probability prediction for each of the 47 characters between 0 and 1. The problem is really a single character classification problem with 47 classes and as such is defined as optimizing the log loss (cross entropy), here using the ADAM optimization algorithm for speed. There is no test dataset. We are modeling the entire training dataset to learn the probability of each character in a sequence. We are not interested in the most accurate (classification accuracy) model of the training dataset. This would be a model that predicts each character in the training dataset perfectly. Instead we are interested in a generalization of the dataset that minimizes the chosen loss function. We are seeking a balance between generalization and overfitting but short of memorization. The network is slow to train (about 300 seconds per epoch on an Nvidia K520 GPU). Because of the slowness and because of our optimization requirements, we will use model checkpointing to record all of the network weights to file each time an improvement in loss is observed at the end of the epoch. We will use the best set of weights (lowest loss) to instantiate our generative model in the next section. We can now fit our model to the data. Here we use a modest number of 20 epochs and a large batch size of 128 patterns. You will see different results because of the stochastic nature of the model, and because it is hard to fix the random seed for LSTM models to get 100% reproducible results. This is not a concern for this generative model. After running the example, you should have a number of weight checkpoint files in the local directory. You can delete them all except the one with the smallest loss value. For example, when I ran this example, below was the checkpoint with the smallest loss that I achieved. The network loss decreased almost every epoch and I expect the network could benefit from training for many more epochs. In the next section we will look at using this model to generate new text sequences. Generating text using the trained LSTM network is relatively straightforward. Firstly, we load the data and define the network in exactly the same way, except the network weights are loaded from a checkpoint file and the network does not need to be trained. Also, when preparing the mapping of unique characters to integers, we must also create a reverse mapping that we can use to convert the integers back to characters so that we can understand the predictions. Finally, we need to actually make predictions. The simplest way to use the Keras LSTM model to make predictions is to first start off with a seed sequence as input, generate the next character then update the seed sequence to add the generated character on the end and trim off the first character. This process is repeated for as long as we want to predict new characters (e.g. a sequence of 1,000 characters in length). We can pick a random input pattern as our seed sequence, then print generated characters as we generate them. # pick a random seed start = numpy.random.randint(0, len(dataX)-1) pattern = dataX[start] print "Seed:" print "\"", ''.join([int_to_char[value] for value in pattern]), "\"" # generate characters for i in range(1000): x = numpy.reshape(pattern, (1, len(pattern), 1)) x = x / float(n_vocab) prediction = model.predict(x, verbose=0) index = numpy.argmax(prediction) result = int_to_char[index] seq_in = [int_to_char[value] for value in pattern] sys.stdout.write(result) pattern.append(index) pattern = pattern[1:len(pattern)] print "\nDone." print "\"", ''.join([int_to_char[value] for value in pattern]), "\""
The full code example for generating text using the loaded LSTM model is listed below for completeness. # Load LSTM network and generate text import sys import numpy from keras.models import Sequential from keras.layers import Dense from keras.layers import Dropout from keras.layers import LSTM from keras.callbacks import ModelCheckpoint from keras.utils import np_utils # load ascii text and covert to lowercase filename = "wonderland.txt" raw_text = open(filename).read() raw_text = raw_text.lower() # create mapping of unique chars to integers, and a reverse mapping chars = sorted(list(set(raw_text))) char_to_int = dict((c, i) for i, c in enumerate(chars)) int_to_char = dict((i, c) for i, c in enumerate(chars)) # summarize the loaded data n_chars = len(raw_text) n_vocab = len(chars) print "Total Characters: ", n_chars print "Total Vocab: ", n_vocab # prepare the dataset of input to output pairs encoded as integers seq_length = 100 dataX =  dataY =  for i in range(0, n_chars - seq_length, 1): seq_in = raw_text[i:i + seq_length] seq_out = raw_text[i + seq_length] dataX.append([char_to_int[char] for char in seq_in]) dataY.append(char_to_int[seq_out]) n_patterns = len(dataX) print "Total Patterns: ", n_patterns # reshape X to be [samples, time steps, features] X = numpy.reshape(dataX, (n_patterns, seq_length, 1)) # normalize X = X / float(n_vocab) # one hot encode the output variable y = np_utils.to_categorical(dataY) # define the LSTM model model = Sequential() model.add(LSTM(256, input_shape=(X.shape, X.shape))) model.add(Dropout(0.2)) model.add(Dense(y.shape, activation='softmax')) # load the network weights filename = "weights-improvement-19-1.9435.hdf5" model.load_weights(filename) model.compile(loss='categorical_crossentropy', optimizer='adam') # pick a random seed start = numpy.random.randint(0, len(dataX)-1) pattern = dataX[start] print "Seed:" print "\"", ''.join([int_to_char[value] for value in pattern]), "\"" # generate characters for i in range(1000): x = numpy.reshape(pattern, (1, len(pattern), 1)) x = x / float(n_vocab) prediction = model.predict(x, verbose=0) index = numpy.argmax(prediction) result = int_to_char[index] seq_in = [int_to_char[value] for value in pattern] sys.stdout.write(result) pattern.append(index) pattern = pattern[1:len(pattern)] print "\nDone." Running this example first outputs the selected random seed, then each character as it is generated. We can note some observations about the generated text. It generally conforms to the line format observed in the original text of less than 80 characters before a new line. The characters are separated into word-like groups and most groups are actual English words (e.g. “the”, “little” and “was”), but many do not (e.g. “lott”, “tiie” and “taede”). Some of the words in sequence make sense(e.g. “and the white rabbit“), but many do not (e.g. “wese tilel“). The fact that this character based model of the book produces output like this is very impressive. It gives you a sense of the learning capabilities of LSTM networks. The results are not perfect. In the next section we look at improving the quality of results by developing a much larger LSTM network. We got results, but not excellent results in the previous section. Now, we can try to improve the quality of the generated text by creating a much larger network. We will keep the number of memory units the same at 256, but add a second layer. We will also change the filename of the checkpointed weights so that we can tell the difference between weights for this network and the previous (by appending the word “bigger” in the filename). Finally, we will increase the number of training epochs from 20 to 50 and decrease the batch size from 128 to 64 to give the network more of an opportunity to be updated and learn. The full code listing is presented below for completeness. Running this example takes some time, at least 700 seconds per epoch. Achieving a loss of 1.2219 at epoch 47. As in the previous section, we can use this best model from the run to generate text. The only change we need to make to the text generation script from the previous section is in the specification of the network topology and from which file to seed the network weights. # Load Larger LSTM network and generate text import sys import numpy from keras.models import Sequential from keras.layers import Dense from keras.layers import Dropout from keras.layers import LSTM from keras.callbacks import ModelCheckpoint from keras.utils import np_utils # load ascii text and covert to lowercase filename = "wonderland.txt" raw_text = open(filename).read() raw_text = raw_text.lower() # create mapping of unique chars to integers, and a reverse mapping chars = sorted(list(set(raw_text))) char_to_int = dict((c, i) for i, c in enumerate(chars)) int_to_char = dict((i, c) for i, c in enumerate(chars)) # summarize the loaded data n_chars = len(raw_text) n_vocab = len(chars) print "Total Characters: ", n_chars print "Total Vocab: ", n_vocab # prepare the dataset of input to output pairs encoded as integers seq_length = 100 dataX =  dataY =  for i in range(0, n_chars - seq_length, 1): seq_in = raw_text[i:i + seq_length] seq_out = raw_text[i + seq_length] dataX.append([char_to_int[char] for char in seq_in]) dataY.append(char_to_int[seq_out]) n_patterns = len(dataX) print "Total Patterns: ", n_patterns # reshape X to be [samples, time steps, features] X = numpy.reshape(dataX, (n_patterns, seq_length, 1)) # normalize X = X / float(n_vocab) # one hot encode the output variable y = np_utils.to_categorical(dataY) # define the LSTM model model = Sequential() model.add(LSTM(256, input_shape=(X.shape, X.shape), return_sequences=True)) model.add(Dropout(0.2)) model.add(LSTM(256)) model.add(Dropout(0.2)) model.add(Dense(y.shape, activation='softmax')) # load the network weights filename = "weights-improvement-47-1.2219-bigger.hdf5" model.load_weights(filename) model.compile(loss='categorical_crossentropy', optimizer='adam') # pick a random seed start = numpy.random.randint(0, len(dataX)-1) pattern = dataX[start] print "Seed:" print "\"", ''.join([int_to_char[value] for value in pattern]), "\"" # generate characters for i in range(1000): x = numpy.reshape(pattern, (1, len(pattern), 1)) x = x / float(n_vocab) prediction = model.predict(x, verbose=0) index = numpy.argmax(prediction) result = int_to_char[index] seq_in = [int_to_char[value] for value in pattern] sys.stdout.write(result) pattern.append(index) pattern = pattern[1:len(pattern)] print "\nDone." One example of running this text generation script produces the output below. We can see that generally there are fewer spelling mistakes and the text looks more realistic, but is still quite nonsensical. For example the same phrases get repeated again and again like “said to herself” and “little“. Quotes are opened but not closed. These are better results but there is still a lot of room for improvement. Predict fewer than 1,000 characters as output for a given seed. Remove all punctuation from the source text, and therefore from the models’ vocabulary. Try a one hot encoded for the input sequences. Train the model on padded sentences rather than random sequences of characters. Increase the number of training epochs to 100 or many hundreds. Add dropout to the visible input layer and consider tuning the dropout percentage. Tune the batch size, try a batch size of 1 as a (very slow) baseline and larger sizes from there. Add more memory units to the layers and/or more layers. Experiment with scale factors (temperature) when interpreting the prediction probabilities. Change the LSTM layers to be “stateful” to maintain state across batches. Did you try any of these extensions? Share your results in the comments. This character text model is a popular way for generating text using recurrent neural networks. Below are some more resources and tutorials on the topic if you are interested in going deeper. Perhaps the most popular is the tutorial by Andrej Karpathy titled “The Unreasonable Effectiveness of Recurrent Neural Networks“. Keras code example of LSTM for text generation. Lasagne code example of LSTM for text generation. MXNet tutorial for using an LSTM for text generation. Auto-Generating Clickbait With Recurrent Neural Networks. In this post you discovered how you can develop an LSTM recurrent neural network for text generation in Python with the Keras deep learning library. Where to download the ASCII text for classical books for free that you can use for training. How to train an LSTM network on text sequences and how to use the trained network to generate new sequences. How to develop stacked LSTM networks and lift the performance of the model. Do you have any questions about text generation with LSTM networks or about this post? Ask your questions in the comments below and I will do my best to answer them. when i try to run the codes, I get an error with the weights file. ValueError: Dimension 1 in both shapes must be equal, but are 52 and 44 for Assign_13 with input shapes [256,52], [256,44]. Confirm that you have copied and run all of the code and that your environment and libraries are all up to date. Just updated all libraries. Still getting the same error. Sorry, it is not clear to me what your fault could be. Thanks. I got it to work now!!! But I am getting random results will work on it further. But i feel like it is a good start. Thanks for the codes! Well done on your progress, hang in there! You have to make the shape equal, either [256,44], [256,44] (or) [256,52], [256,52]. This was caused by the weights.hdf5 file being incompatible with the new data in the repository. I have updated the repo and it should work now. I’m excited to try combining this with nltk… it’s probably going to be long and frustrating, but I’ll try to let you know my results. Good luck Max, report back and let us know how you go. Did you get anywhere with combining NLTK with this? The file names are unique, probably there is a collision of names in keras or h5py for me. Found my mistake, I didn’t edit topology.py in keras correctly to fix another problem. This is my second attempt to study NN, but I always have problems with versions, errors, dependencies and this scares me away. I don’t think I can give you good advice if you are modifying the Keras framework files. I followed your tutorial and then built my own sequence-to-sequence model, trained at word level. Might soon share results and code, but wanted first to thank you for the great post, helped me a lot getting started with Keras. Great, well done Alex. It would be cool if you can post or link to your code. I know it is an old post but did you Alex ever shared your code for word level training? Note, that the ‘\r’ is missing, why ? It is not needed on some platforms, like Unix and friends. Only windows uses CRLF. I am running the fitting as I type. Thank you for your reply, Jason. Can I generate a text book the size of Alice in Wonderland using the same technique ? Do I generate 50,000 characters for example ? And how do I use a “SEED” to actually generate such a text ? In the example you are using a 100 characters as a way to breakup the text and expose it to the network. DOES increasing the characters help with producing a more meaningful text ? How many epochs should I run the fitting ? 100, 200 ? Because the loss keeps decreasing, but if it gets close to zero is that a good thing ? Great questions, but these are research questions. You would have to experiment and see. Hey, nice article. Can you explain why you are using 256 as your output dimension for LSTM? Does the reasoning for 256 come from other parameters? The network only outputs a single character. There are 256 nodes in the LSTM layers, I chose a large number to increase the representational capacity of the network. I chose it arbitrarily. You could experiment with different values. I’m glad you found it useful Lino. Thanks for the nice article. Why do we have to specify the number of times-teps beforehand in LSTM ( in input_shape)? What if different data points have different number of sequence lengths? How can we make keras lstm work in that case? The network needs to know the size of data so that it can prepare efficient data structures (backend computation) for the model. Thanks a lot for the code and the easy explanations. Could you give some insights on why this is happening and how to fix it? Ouch, something is going on there Bruce. Perhaps confirm Keras 1.1.0 and TensorFlow 0.10. It looks like maybe the network was not trained for long enough or the character conversion from ints is not working out. Also, conform that there were no copy-paste errors. How to take the seed from user instead of program generating the random text ? This is how you can deal with user input. Hope this helps. Can you please explain the need to reshape the X ? What is wrong with the initial shape of list of lists? All LSTM input must be in the form [samples, timesteps, features]. The data was loaded as [samples, timesteps]. Rather than timesteps, think of sequence – it’s the same thing. Using a similar approach: Can one generate numeric sequences from time series data, much like sentences? I don’t see a reason why we can’t. Any input is appreciated, Jason. thanks. For sure, change the output from one node to n-nodes. For sequence output, you’ll need a lot more data and a lot more training. Thank you, but why should we change to n-nodes? Considering you generated a sequence of text, can’t I get a numeric sequence with the same 1 node setup? result = int_to_char[index]” part of the code. Can you please explain why its necessary? I’m new to your website….Keep up the great work! Looking to hear from you. Yes, there are a few ways to frame a sequence prediction problem. You can use a one-step prediction model many times. Another approach is to predict part or the entire sequence at once, and all the levels in between. Selects the node with the largest output value. The index of the node is the same as the index of the class to predict. Thanks for the clarification, Jason: I got the code running with decent predictions for time series data. I think you might want to add in the tutorial that prediction usually works well for only somewhat statistically stationary datasets, regardless of training size? I’ve tried it on both stationary and non-stationary, and I’ve come to this conclusion (which makes sense). Very often, time series collected from both financial and scientific datasets are not stationary, so LSTM has to be used very conservatively. Thanks ATM! I agree, I’ll be going into a lot more details on stationary time series and making non-stationary data stationary in coming blog posts. I have been running this. But thebloss instead of decreasing is always increasing. So far, i ran it for 20 epochs. Do you have any idea what might be the case. I didn’t change anything in the program, though. Maybe your network is too small? Maybe overlearning? the dataX and dataY will likely crash due to size constraints, how could I circumvent that issue and use the full dataset ? Perhaps read the data in batches from disk – I believe Keras has this capability for images (data generator), perhaps for text too? I’m not sure off hand. Thanks for the example. I wonder about the loss function: categorical cross-entropy. I tried to find the source code but was not successful with it. Do you know what a loss of 1.2 actually means? Is there a unit to this number? From my understanding, the goal is to somehow get the network to learn a probability distribution for the predictions as similar as possible to the one of the training data. But how similar is 1.2? Obviously a loss of 0 would mean that the network could accurately predict the target to any given sample with 100% accuracy which is already quite difficult to imagine as the output to this network is not binary but rather a softmax over an array with values for all characters in the vocabulary. Great question. I need to dedicate a post to this question, thanks for the prompt. I’ll work on a write-up ASAP. Yes, the code will work on either backend. This is pretty frustrating (while still incredibly awesome), do you have an idea why this should happen? Regardless, this is such a great post that gives access to RNN and LSTM in a great nature! The network may require greater representational capacity. Try more layers and/or more neurons per layer. Would we get better result if we trained the network at the word level instead of character? We would split the dataset into words, index them, the same way we do with the characters, and use them as input. Wouldn’t that at least eliminate the made up words in the generated text making it seem more plausible? Yep. Try it out Jack! I’d love to see the result. I agree that the word level modeling would be much more intuitive and sentences might show some meaningful results. One issue is that you have 47 features to choose from if you go character level. However, the number of unique words is orders of magnitude larger than unique characters. Therefore, your network becomes much larger. You can add an embedding to reduce input dimensionality, however, the output softmax will still be large. Is there any benchmark dataset for this task, to actually evaluate the model ? Not as far as I’m aware Fateh. Hi Jason amazing post! I have a doubt. I tried the following: instead of training with Alice’s Adventures, I train with this a list of barcodes. Unique barcodes in a plain text (example, 123455, 143223, etc etc) and they can be of different lengths. Is this approach still valid? What i want to do is to input a potentially barcode with errors (maybe a character is missing) and the LSTM returns me “the correct one”. Any suggestion? Many thanks in advance! LSTMs can indeed correct sequences, but they would need to memorize all of the barcodes. You would then have to train it to fill in the gaps (0) with the missing values. You could also try uses an autoencoder to do the same trick. Do you have any suggested read for either LSTM as a “word corrector” or an autoencoder for that task? Sorry I don’t Don. Good luck with your project! Hi Jason, thank you very much for your post. I was thinking about changing the input and output to be a coordinate, which is 2D vector (x and y position) to predict movement. I understood that we can change the input to be a vector instead of scalar. For example using one hot vector like you’re suggesting. However, I don’t understand what to do when we want the output to be a 2D vector. Does this mean that I don’t need to use softmax layer as the output? Hi Alex, interesting idea – movement generator. You can output a vector by changing the number of neurons in the output layer. The features in the exercise are characters which are mapped to integers. It’s like replacing a nominal vector by a continuous variable. Isn’t that an issue? Also, would you consider using Embedding as the first layer in this model – why or why not. Thank you, your posts are immensely helpful. The input data is ordinal, either as chars or ints. The neural net expects to work with arrays of numbers instead of chars, so we use ints here. An embedding layer would create a projection for the chars into a higher dimensional space. That would not be useful here as we are trying to learn and generalize the way sequences of chars are put together. I could be wrong though, try it and see if you can make it work – perhaps with projections of word sequences? Thanks Jason. This is helpful. On the embedding layer, I have another question – how are the projections learnt? Is it a simple method like multiplying with a known matrix or are they learnt iteratively? If iteratively, then are they learnt a) first before the other weights or b) are the embedding projection weights learnt along with the other weights. The below code for text generation is treating chars as nominal variables and hence giving assigning a separate dimension for each. Since this is a more complex approach, I will check if this leads to an improvement. Again, thanks for your response. It only added to my curiosity . I’d love to hear how the representational approaches compare in practice Ashok. Jason, could you explain please how the input data is ordinal? Instead of one-hot encoding we simply enumerate characters. I have the same question. Have you found any answer? Nice work. But I don’t really understand what is the point of applying RNN for this particular task. If one wants to predict the next character of a 100-long sequence, this is seems me achievable with any other common regression task where you feed in the training sequences and the following single character as output while training. What is the additional feat of your approach? Yes, here are many ways to approach this problem. LSTMs are supposed to particularly good at modeling the underlying PDF of char or words in a text corpus. The example doesn’t run anymore under TensorFlow 1.0.0. (previous versions are OK, at least with 0.10.0rc0). What error do you see Hendrik? Great post Jason, I was trying to do almost the same thing and your post gave a lot of help. As some of the comments suggest, the RNN seems to achieve a loop quite quickly. I was wondering what you meant with “Add dropout to the visible input layer and consider tuning the dropout percentage.”, seems it appears to attack this problem. You can apply regularization to the LSTMs on recurrent and input connections. I have found adding a drop out of 40% or so on input connections for LSTMs very useful on other projects. I advanced my experiments and found some interesting things, I will probably do a Medium about it. Isn’t that cool? I hope that helps other people. Very cool Gustavo, thanks for sharing! First of all big thanks to Jason for such a valuable write up. Could you please explain in a little more detail what you did there. i didn’t understand, how you got such a good output on a single layer. See below the output i am getting..
As you can see here a text is repeating itself. This the result of 20th epoch out of 50 epochs in a dual layer LSTM with 256 cells and a sequence of 200 characters. This is a result pattern i am seeing in all my trainings and i believe i am doing something wrong here. Could you please help out? I had a very similar experience in my own experimentation. This comment verified what I had found — thank you for sharing Jatin! This normalizes the integer values by the largest integer value. All values are rescaled to 0-1. Is this because it’s using a relu activation function? Or because generally you need input values to be between 0-1? LSTMs prefer normalized inputs – confirm this with some experiments (I have). Hello~ I am your one of fans. I have a question about lstm settings that I may apply your text generation model in a different way. Your model generated texts by adding(updating) a character. Do you think it is possible to generate texts by adding a word rather than a character. If it is possible, adding word_embedding layer is effective for a performance of text generation?? Yes, I expect it may even work better June. Let me know how you go. You know, I am a doctoral student majored in management information system. My research interest include medical informatics and healthcare business analytics. Your excellent blog posts have helped me a lot. I’m really glad to hear that. Thanks for your support and your kind words, I really appreciate it. Very interesting example – can’t wait to try training on other texts! I have a question regarding the training of this, or in fact any neural network, on a GPU – I have a couple of CNNs written but that I can’t execute :(. Suppose I am using either Amazon EC2 or Google Cloud, I can successfully log into the instance and run a simple ANN using just a CPU but I am totally confused as to how to get the GPU working. I am accessing the instance from Windows 10. Can you tell me the exact steps I need to do – presumably I need to get CUDA and CUDNN somehow? Then is there any other stuff I need to do or can I just pip install the necessary packages and then execute my code? My best advice would be to use an AMI that is already set up to use the GPU. Does your Deep Learning book expand on (2) in regards to LSTM’s? It seems problematic to output the same predictions over different inputs. seq_in is the input sequence used in prediction. Agreed it is not needed in the latter part of the example. His fix is not needed, it can just reduce the size of the universe of possible values. My book does not go into more detail on this. I am working on a new book dedicated to LSTMs that may be of interest when it is released (next month). “””Get rand index from preds based on its prob distribution. Helps to solve problem of repeated outputs. I wanted to ask you if there is a way to train this system or use the current setup with dynamic input length. The reason for that is if one to use this for real text generation, given a random seed of variable length say.. “I have a dream” or “To be or not to be” would it be possible to still generate coherent sentences if we train using dynamic length? I tried with pad sequence in the predict stage (not the train stage) to match the input length for shorter sentences, but that doesn’t seem to work. I would recommend zero-padding all sequences to be the same length and see how the model fairs. You could try Masking the input layer and see what impact that has. You could also try truncating sequences. I have a post scheduled that gives many ways to handle input sequences of different lengths, perhaps in a few weeks. That would be much appreciated. Looking forward to it. Hi, thank you for the post. I was wondering if the subsequent post (discussed in this question thread) about implementing dynamically sized user input was ever posted? If so, which article is it? Thank you! I need to thank you for all the good work on Keras, wounderful and awesome package. However, i got a floating point exception (core dumped) running the code. Please, i need your advise to resolve the issues. I have upgrade the my keras from 1.0.8 to 2.0.1 and the issues is still the same. Perhaps you could try a different backend (theano or tensorflow)? Perhaps you could try posting to stackoverflow or the keras user group? This can happen and is caused by exploding or vanishing gradients. Thanks for the example. Piush. I tried your suggestion and the problem of nan for loss and accuracy still the same after second epoch while the batch size is 39/50. I have also try all the activation function and regularization but still the same problems. Too bad! The problem of loss and accuracy becoming nan after few epoch as to do with the batch generator. I fix it now. Thanks for your great post it helped me a lot. Since I finished reading your post, I was thinking of how to implement it in a word level instead of character level. I am just confused of how to implement it because with characters we only have few characters but with words we might have say 10000 or even more. Would you please share your thoughts. I am really excited to see the results in a words-level and make further enhancements. I would recommend ranking all words by frequency the assign integers to each word based on rank. New words not in the corpus can then also be assigned integers later. Perhaps your environment cannot see the h5py library? Confirm you installed it the correct way for your environment. Try important the library itself and refine env until it works. It was solved, I just restarted python after installing h5py. when I predicted using the model, it through the characters like this, whats up with the 1s why are they coming? I don’t know. Confirm that you have a copy of the code from the tutorial without modification. Great tutorial. I have just one doubt though, in np.reshape command what does feature mean? and why is it set to 1? The raw data are sequences of integers. There is only one observation (feature) per time step and it is an integer. That is why the first reshape specifies one feature. I have one question. I need predict some words inside text and I currently use LSTM based on your code and binary coding. Is a good practice to use n-words behind and k-words ahead of word which I want to predict? It’s good to train model on data like this or we must rather use only data behind our prediction? Try a few method and see what works best on your problem. Why not one hot encode the numbers? Also try an encoding layer. There are many ways to improve the example Joe, let me know how you go. Great post. Thanks much. I am very new to LSTM. I am trying to recreate the codes here. How to increase the number of epochs? Thank you so much for these guides and tutorials! I’m finding them to be very helpful. I’m glad to hear that Greg. Thanks for your great post, and all the other great post as a matter of fact. I’m interested to train the model on padded sentences rather than random sequences of characters, but it’s not clear to me how to implement it. Can you please elaborate about it and give an example? Thanks again for the post and all the info! I have another question. What should I do if I want to predict by a inserting a string shorter than 100 characters? I have a question regarding the number of parameter in the model and the amount of data. When I look at the summary of the simplest model, I get: Total params: 275,757.0, Trainable params: 275,757.0, and Non-trainable params: 0.0 (for some reason I didn’t succeed to sent a reply with the whole summary). The number of characters in the Alice book is about 150,000. Thus, isn’t the number of parameter larger than the number of characters (data)? Isn’t that over-fitting? I ask because you suggested to improve the quality of results by developing an even much larger LSTM network. But if in the simple LSTM network you already have more parameters than data, shouldn’t you simplify the network even more? Thanks a lot for all the tips! A simpler model is preferred, but overfitting is only the case when skill on test/validation data is worse than train data. What if I want to output the probability of a sequence under a trained model rather than finding the most probable next charterer. That would be a different framing of the problem, or perhaps you can collect the probabilities of each char step by step. So when I train, Xs is similarly he sequence, but what would the Ys be ? The next char or word in the sequence. Yes, it is the same framing. The difference is how you handle the probabilities. Sorry, I should have been clearer. E.g. you can beam search the probabilities across each word/char, or output the probabilities for a specific output sequence, or list the top n most likely output sequences. Is it the layer size or a bug in one_hot_encoding? The fault is not obvious to me, sorry. If I begin with some random character and use the trained model to predict the next one, how can the network generate different sentences using the same first character? It will predict probabilities across all output characters and you can use a beam search through those probabilities to get multiple different output sequences. I’m attempting to run the lastf ull code example for generating text using the loaded LSTM model. However, line 59 simply produces the same number (effectively a space character) each time across the whole 1000 range. Not sure what I’m doing wrong ? Sorry to hear that Sam. Have you tried to run the example a few times? Have you confirmed that your environment is up to date? the world with the shee the world with thee shee steel. However, if you introduce some randomness by sampling the prediction probability distribution randomly, you get much more interesting results – although it’s gibberish, there are many gibberish words that are pronounceable – ie not just randomly selected, and the overall effect looks like it might be middle English, or even german in places. The randomness means that sometimes it doesn’t get the line breaks in approximately the right place. Nonetheless a very interesting result, and it doesn’t loop. I love the way it puts the sonnet number in the right place! shese blunq so me for they fadr mnhit creet. nadengoes’dflret, acseriog of shein puonl. ming oat,s al she wantero wo me. o beau aal wierefe, oo ttomnaei ofs. PS this is just to test it out – I really want to generate synthetic time-series data, but I found that just predicting the next value then running generatively always produced a decay to a constant value. PS – having cut pasted it the pasting on this blog puts the sonnet number in the wrong place at the beginning of the line. In the generated text, the sonnet number is centred, ie preceded by a number of spaces, as in the original. Perhaps you can use a beam search to better sample the output probabilities and get a sequence that maximizes the likelihood. Sounds like a good idea, and also applicable to my goal – to generate synthetic sensor data. Glad to hear it Iain. Thanks for such a nice effort in deep learning stuff. It looks like the file or path does not exist. Perhaps check that the file with that name exists in the current working directory. Thanks for the interesting post. I am getting the exact same errors as Vibhu. When you say working directory do you mean the one in which the code resides? In packages? The directory where you are working, where you have saved your code file. – Too much classes? With letters we have arond 30 or so classes (as we have the alphabet + the residual tick/backtick). Does it have really an impact during learning so generation can give this kind of repetitive result? + A few notions from the Markov chain is staying with me and I have a supposition why the system repeats in such cases : maybe the link between words isn’t pronounced enough fror the generator to choose anything else than what was provided to it? – Wrong parameters? I’m trying multiple settings for the learning process, such as changing seq_length to 10 or 50 or something else and/or changing the batch size? – Corpus too small? Should I grab other books? – Training too short? Is 60 epochs a relatively small or important processus? – Note : I’m currently using a set to remove repeated sequences once the text tokenized . It really helps is seq_len is small, I think it could also help for character-based processing. That’s additional init overhead, but I think it might worth it. Thanks for the article, it was pretty interesting and made me learn quite a bit on notions I forgot or didn’t understand well. I look forward to learn more and understand how to progress! Great work, I recommend testing each hypothesis. Instead of letters, can we map each individual word to a number? Then we can use a few words worth of context to predict the next word. So we could have [“I”,”am”,”a”] as the input and have [“human”] as the output. I’m still learning a few concepts, so I might be wrong. You may have to visit the link twice to set/use the cookie. Just wanted to say you are an amazing human who is enabling tons of people to learn complex material that otherwise might not be able to. I’m also astounded with your dedication in responding to literally every single comment, and within a short time too. You’re making the world a better place. Thanks Ari, I appreciate your support and recognition! Hi,Jason, Thank you so much for the great post! Could you please give me some insights on why this is happening and how to fix it? Perhaps double check that you have copied all of the code from the example exactly? Once the network has been trained and all the weights have been fixed at some acceptable values, would the network generate different text every time it is fed the same input seed text (“What would happen” , for example), or would the output text sequence always be the same for that exact input seed because the next character with the highest probability after the sequence “What would happen” would always be predicted to be the same on each run due to the network’s fixed weights, and then the next one after appending the previously predicted character to the input as well, etc.? I am working on a similar LSTM network in tensorflow for a sequence-labeling problem, and so far it appears that my generated output sequence is always exactly the same for a fixed starting input. Is there a way to generate different output sequences for the same input seed? Once the network is trained, it will make deterministic predictions. Thank you for the answer. I suppose what I was describing was a stochastic Neural Network. May I ask why you used a normalized X vector as input and not just onehot-encoded input? Is this done by someone else as well? Just curious because I don’t really see an advantage over onehot encoding. I would recommend one hot encoding instead these days. Can you put your pretrained weights? Yes, you can use pre-trained weights. Shouldn’t we use word2vec instead of one-hot encoding? You can, try it and see. thanks for this great post. Do you have experience in using the LSTM as a model for Genetic Programming to further improve the output? Or have you ever heard about it? It would then be something like an EDA-GP. If you know anything about it, i’d be happy if you let me know! I’ve not heard about using LSTMs with GPs. Interesting idea. What makes you want to explore this combination? Oh I was just wondering. I’ve recently seen some other text generation work, they implemented it quite similarly as you did but came to the conclusion that in future this could probably be improved by using the LSTM as a model for a genetic program, to add further constraints and thus to improve the output. I just wanted to know if something like this has already been implemented. Yesterday I came across a really interesting paper. (https://arxiv.org/pdf/1602.07776.pdf) They invented a new method: Recurrent Neural Network Grammars (RNNGs). They report major improvements both in language modeling as also in parsing. I will maybe try this out, as a topic for my master thesis. Thanks for you prompt reply! Hi Jason, thank you for your great site and all the material that you offer. I’ve been trying to modify the LSTM to predict words instead of letters. I stripped all special characters and numbers from the text and vectorized the words. It’s 26386 words in total and 2771 distinct words. The model could be trained, but it always and only predicts the word “the” as next word. I tried different sequence lengths with the simple and the complex model, but the result stays the same. Of “the” is the most frequent word with 1600 occurences, but shouldn’t the model still be able to predict something else? Or is the corpus just too small? What do you think? Hi, Thanks for good contents, I have a question. Is it possible to make similar sentence with RNN? Yes, generate multiple times, or generate once and use beam search to read off multiple output lines. This tutorial was a great help to me. Thanks for this. But I have a question regarding deep learning. As Deep Neural Networks take large amounts of time to train how can I tune different hyper-parameters of the model easily? You can use multiple computers in the cloud in parallel to perform parameter tuning. You could also try tuning using a smaller amount of data that requires less time to train. But this may impact the quality of the results. Hi Jason, Thank you so much for this blog. It was very easy to understand, and really helped consolidate the theoretical aspects. I’ve just recently gotten to RNN’s and quite surprised how effective they are. It seems they are used for musical note generations as well. Do you mean to split the text into sentences, and pad each sentence with zeros to match the max length sentence? As you have used 100 characters to predict the next one, I wanted to know is there any method that I can use to remove this restriction. I want the user to input any character length sentence and generate sentences using it. Thanks. Is there any other way instead of padding the sentences? I really do not want to do this. You can pad and then use a mask to ignore the padding. You can also change the model to operate on one time step at a time and manually reset state. Sure, you have configure it anyway you like. The model will need to tuned for your specific framing. Hi, Jason. Thank you for your nice blog. By the way, when I run this code, I got a ValueError message. And I thought that I run this code exactly same as yours, but I got a message like that. Did I doing something wrong?? Never mind. I did it wrong. The problem is solved. Sorry to hear that, I have not seen this error. Perhaps the API has changed? In that we are providing a sequence of integers. When training on my own data, I notice after around 25 epochs the loss starts to increase. I’ve tried adding a batchnorm layer but it doesn’t do much. Any idea? The algorithm is stochastic so it may get different results each time it is run. Perhaps try fitting the model a few times? ValueError: Dimension 1 in both shapes must be equal, but are 60 and 47 for ‘Assign_5’ (op: ‘Assign’) with input shapes: [256,60], [256,47]. Of course weights-improvement-20-1.9161.hdf5 is my file. Perhaps test making predictions prior to saving and then use the same code after loading so that you know it works. index = numpy.argmax(prediction) only output the maximum value 1. When it converts the index value to char ie.., int_to_char[index] in the dictionary int_to_char the key for 1 is the newline. How should I overcome this? Perhaps the model requires further tuning on your problem? Why didnt you assign batch size(64) same as sequence size(100)? I still confuse how sequence and batch work when they dont match each other. One batch is comprised of many sequences. One sequence is one sample or list of time steps. Your posts, and your attentive responses to comments are amazing. Thanks for that. I’ve had some success training a model using words instead of characters. I think it would be interesting to augment each word with synthetic features (parts-of-speech, for instance). But, I can’t wrap my head around how to do this properly? In my mind, I feel that there would need to be a second sparse array with POS-tagging. And perhaps this variable is given a weight of some sort. Does this make sense? Is this possible with the Keras LSTM models? Yes, that makes sense. The input would be a mess and hard to keep straight though. It might be easier to separate the streams and have a multi-input model instead. Just and idea. If you go down this road, I’d love to hear how you go. Thanks for the response. I’ll work on this and will definitely share the results. I have some other speculative features that I want to experiment with as well. If we have 1 million words to predict, shall we still use one hot encoding and softmax in output layer? It might cause memory problem. Is there any way to solve this problem. I have seen some papers that look at splitting up large one hot encoded vectors into multiple pieces. Perhaps try searching on google scholar? I am not sure how this code will work? Should this not give an error? sir what is the procedure for generating a sentance from a set of keywords……..i am having the following data…..
Good question, I have not worked on this type of problem. Perhaps survey the literature to see what your options are? How and where to change the “temperature”, i.e., scale factors? I am currently working on a project. The idea is to generate the description of a product for example from characteristics and keywords. My learning base is a set of product descriptions. I would like to give my model some characteristics, key-words and that it generates me a description from it. The first step would be to prepare thousands of examples, somehow. It is really great that you take time to reply to each question. Something extremely unusual in today’s world. How come you did not use any validation or test set? Will it be a valid argument to not use any validation or test set as I only want to generate text based on the training data alone? say, i am trying to generate a text based on all harry potter books.. I only want to generate text, words, phrases, sentences based on what my model has learnt and known, since validation and test sets are just there to validate that your trained model can classify and predict what is unknown, it will be of no use already? It is a challenge to test the generative model that is supposed to generate new/different but similar output sequences. It depends on how the model was defined, e.g. what the model expects as input. In this tutorial, it expects a seed sequence of 100 words. Nice tutorial. With one hot encoding for the input sequences, one can get a loss of 1.22 in less than 10 epochs. Don’t forget to also do this in the text generation part, using enc_length as the second parameter when generating one hot encodings for the seeds. Again, this was/is a really fun and straightforward example to work with. Thanks Jason. Thank you for this nice tutorial. I didn’t really get why you used one hot encoding only for the output character? why for example you didn’t use integer encoding for the output pattern, it will calculate also the output probability for it if it was encoded as the input. An integer encoding was used for the inputs and passed directly to the LSTM. I have another question, Can we use here also word2vec instead of converting the characters to integers and then scaling. Or it won’t be character to character model anymore ? Perhaps, I have not seen embedding models for chars, but I bet it has been tried. I have adapted your code in kaggle.com to try and fit project gutenberg txt files on Shakespeare’s plays mentioning you and this website. Hello Sir, thank you for the post! I have created this model and trained it on a different data set. The results contains sequences repeating infinitely in a loop. Can you please share some insights? Perhaps the model is over fit? When I tried running the final complete code it shows an error saying im trying to load a weight file containing 2 layers into a model with 3 layers. I have not seen this, are you sure you copied all of the code without modification? Are you sure you have the lates version of the libraries installed? Are you able to confirm that all of your libraries are up to date and that you copied all of the code from the tutorial? Hello, Sir. This is not about this post, but your posting about RNN. I read your post about RNN and how the weight. So, how we can get the WHy matrix? for WXy matrik, we initiate it. But for WHy matrix i don’t understand. Can you help me, please? How did you settle on a 256×256 hidden layer? I ask because I’m interested in not paring out caps, and the vocab in what I’m learning on has expanded to 132 characters. In doing so I’ve gotten the loss down to 1.3, and the generative text is still producing a *LOT* of typos. If I added more neurons to the LSTM layers, could the bot improve? How many neurons? Or would it be more beneficial to allow the network to train to an even lower loss on the current 256×256 network? As you mentioned, we can also experiment with other ASCII data, such as computer source code. So I need to use this post to create a program repair model. The input will be a buggy code and the output will be the fixed code. I have some vulnerable/buggy examples and their fixes but I don’t know how to generate a dataset and make a train for that. Sorry, i don’t have examples of repairing bugging code with LSTMs, perhaps in the future. Hi. Thanks for this post. I have one question. How come you aren’t providing the output labels of every timestep? For example when the input is ‘HelloWorl’, then the output is ‘elloWorld’, if we are using 9 timesteps. For your example, there is only one letter for each sample. How are you going to provide the corresponding outputs for the timesteps then during training? I’m not sure I follow, sorry? hey jason, check out a blog post i made that leverages some of you methodology! Thank you for the nice article. It made many things easy for me… haha. seq_in is set but doesn’t seemed to be used. If it is not used, you can ignore it, delete the line. Please give me information a baut specification minimum ( ram, processor, etc) a laptop for running 3D-Unet-Pytorch for classification images 2D/3D.and can i try MINST data set for 3D images. You can train on your CPU or use AWS if you need to access GPUs. ValueError: You are trying to load a weight file containing 1 layers into a model with 2 layers. Any idea what’s the problem? The number of nodes in the first hidden layer is unrelated to the number of units (defined by input_shape). Hello Jason, great tutorial, as always!! Just curious to know the possibilities of implementing Sequence mining use case here. Can we use Generative LSTM Networks for sequence mining? This is to suppress the events. I have a dataset with 2 million sequence of events, where we have root events and child events. We have to suppress all the child events based on root event presence. This pattern needs to captured by Generative LSTM model which is trained on 70% of the whole data. And then apply this trained model on test data (30%) to perform event suppression to dedue the whole number of events. Sorry, I don’t know what “sequence mining” is? General conclusion about array: there is a groups of numbers they are connected with the mathematical operations of subtraction and additions but there is no connection between groups except that they represented the journal entries in a bookeeping. It may be possible, perhaps try it and see. I got this error when using your code, any help or advice you could give me? You must change the filename to the file in the code that you saved. I just might not have seen the part, but could you please tell me what file that would be? I didn’t see a part about saving a file. I am new here,can i use this model to train a text time-based collection of documents and then predict the documents that will be generated at a future time point. Perhaps, you may have to experiment a little to discover a suitable model. Can you recommend some papers or documents that have done this to me ? Thank you Jason . Hi Jason, I follow your posts and they are absolutely great. But I am trying to generate text using tensorFlow. I have trained my model using tensorflow’s original RNN code; https://www.tensorflow.org/tutorials/sequences/recurrent#tutorial_files; but not sure how to predict and test my model. Looking forward to hear from you. Sorry, I don’t have TensorFlow tutorials, I focus on Keras that runs on top of TensorFlow. Hi Jason thank you for this great tutorial. In this tutorial, if you keep training until you get really good accuracy, say 99%, isn’t that just memorizing the data? The end goal is to generate something new right? Yes, the idea is to have a dataset that is large enough or a model that is regularized enough that it cannot be memorized. I have seen your tutorial and tried it. I am now using a different project, where we want to launch an LSTM network in production. In other words, we have a Time Series Prediction network, and we want to place it on AWS or Azure. We have also seen Tensorflow Serving as a way of putting these Networks online. The only thing i’m afraid of is the performance of LSTM. When training an LSTM network, the Long- and Short-term memory is crucial. The weights get adapted as well, so they are important. If we save the model – like you did in the tutorial – will we still get good results if we try to run a test-seed through it? Some seed it has never seen before, like some kind of user-input? I’m afraid that it will not get great results, as the Hidden states are lost now, and the seed will make for new hidden states, that are completely different. Or am I totally wrong with this? Thank you in advance for taking your time to reply! Perhaps try using an ensemble of final models to reduce the variance? Perhaps design tests for the system before deploying it into production (e.g. good engineering practices). Consider having a transform that converts a word (or a few words) to a binary vector, multi-hot. Now, I want to convert back the binary vector to the original word (or words). Can this be done using RNN/LSTM? Of course, I can train the model using a train set (given the words and their corresponding binary vector), but, then, test it with a predicted binary vector, hopefully, to predict the correct words. Yes, calculate the argmax() of each vector, then map the integer to the word in your vocab – a reverse lookup. I believe I have examples in many tutorials of this. Is it possible to generate sequence using return_sequence=False ? Meaning that only the last timestep is being predicted in train – how would a generation look like ? I’m not sure I understand your question, sorry, can you elaborate please? You can frame any sequence prediction problem you wish and test whether an LSTM performs well or not. As far as I understand , the return_sequences=True means that there will be an output in every item in the sequence (many-to-many) and Tx=Ty. and if return_sequences=False there will be only one output to the sequence (of the last) and only it will be accounted for in the Loss function. So , can return_sequences=False be used in a generation-task such as this ? Yes, but the results will be poor when making a prediction with the output of the LSTM layer directly. It is better to use one or more fully connected layers to interpret the output of the LSTM. Thank you for the informative tutorial. Sorry, I have not seen this error. Perhaps try searching/posting on stackoverflow? I have trained the model and saved the weights. How do I now get the model to generate the SMILES strings with variable lengths. Perhaps train the model on zero-padded but variable length content inputs that have a “end of string” char (e.g. like a period). Then generate new sequences and stop when that char is encountered. Thank you for the advice, but what if it is important for the model to understand the end of the sequence or there is a specific pattern at the end. Sorry, I don’t follow, what is the concern exactly? Thank you for the wonderful explanation about the text generation and also providing the code with point to point explanation. which btw I’m running on a google cloud instance with 120 GB of RAM but it exhausts it all. 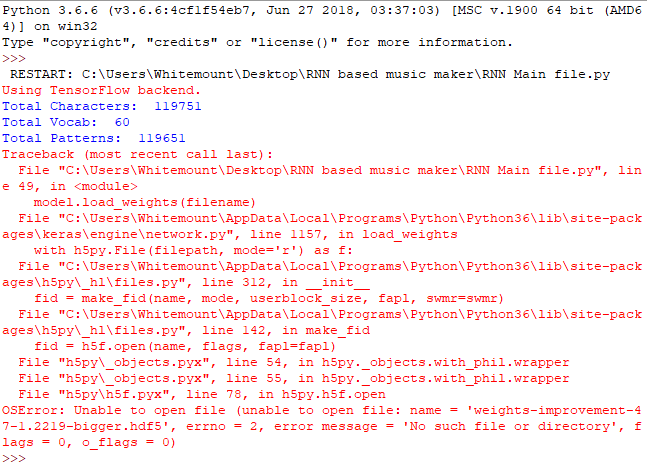 I’ve contemplated just training on a file with 1m lines of text and that’s become 10 smaller files of 30 mbs but I wonder is it possible to know how much the main file would need in RAM (lyrics.txt) and can I get it to work in a batch method either using the smaller files and a kind of fit_generator method. You can estimate the RAM based on the number of chars and the choice of 8-bit or 16-bit encoding. Perhaps progressive loading with a custom data generator would be the way to go? This is a wonderful post, thanks for sharing. I have a different problem to solve and was wondering if it can be solved using your solution. I have a corpus of numerical data (structured) and its corresponding article (readable text). i.e. A simple table with numbers in it and a paragraph explaining the table. How can this dataset be used to train the model and then used to generate paragraphs based on any input of the table form? Try a model that might use an MLP, CNN or LSTM to read in the numbers, and then a decoder to output text – maybe one output for the table and one for the text. Thank you for such an amazing post. I did a complete tensorflow version of the same. It would be great if you can write some blogs on BERT and GPT. Highly appreciate the work you’re doing for the AI community. Hi Jason, Thanks for the tutorial. I have a set of words. The word(s) might have spelling error(s). From the set of words, I would like to generate a sentence. The set of words might ( in most of the cases ) be in the order of the sentence formation, BUT there might be missing words also. I am working on multiple NON English languages, where tools such as POS tagger, etc are NOT available. For one language, I have some pretty good amount of corpus. And for one, very less amount of corpus. The sentence that I have to generate using the set of words may or may not be present in the corpus. (Any steps or tutorial guide will be helpful). I think some development and prototyping might be required – there’s no step-by-step tutorial for this. Perhaps you can get some ideas from related text-correction papers? I was think of spelling correction followed by text sequence generation. Anyway, I will look into it. Thanks! Hello, I would like to know your opinion on why it is better to generate text predicting letter by letter and not word by word. I’m trying to make a text generator in Spanish, with the little prince’s book, the results letter by letter and word by word are different but none I like. Letter by letter I get sentences with more global sense, but with incorrect letters. But word by word I get incoherent sentences. I don’t know, perhaps you can design some experiments to help tease out the cause and effect. Perhaps it has to do with the limited cardinality if the input/output (letters vs words).